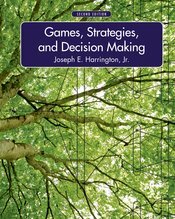 Written for majors courses in economics, business, political science, and international relations, but accessible to students across the undergraduate spectrum, Joseph Harrington's innovative textbook makes the tools and applications of game theory and strategic reasoning both fascinating and easy to understand. Each chapter focuses a specific strategic situation as a way of introducing core concepts informally at first, then more fully, with a minimum of mathematics. At the heart of the book is a diverse collection of strategic scenarios, not only from business and politics, but from history, fiction, sports, and everyday life as well. With this approach, students don't just learn clever answers to puzzles, but instead acquire genuine insights into human behavior.